Pollution is the main factor concerning water sources in the city, but unfortunately this problem is widespread. Drilling wells in the city is not an option due to the major network of underground sewage, electrical and subway systems. With a lack of functional plumbing and running water, it will need to be collected using various methods and then purified in a 2-step process, first with a communal filtration and then boiling in smaller batches. Every building with eavestroughs should have barrels under the gutter downspouts to collect rainwater. The barrel should have a mesh covering to filter out leaves and keep out rodents, and should always be covered with a lid when it’s not raining. 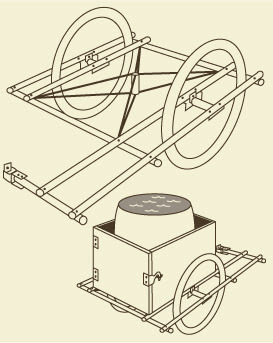 For larger systems of collecting rain water, several barrels can be connected together with hoses or pcv pipes near the bottom of each barrel. To easily drain the water for use, either attach a small pump at the top of one of the barrels, or afix an open hose to the bottom of one, with a mechanism to open and close the flow. Collected rainwater will have various contaminants, including silt, debris, bird droppings, dust, insects, and other natural materials. If the water collected is to be used for irrigation, no filtration is required and in fact natural materials add to the richness of this soft water for soil and plants. To filter the larger particles, build a filter at the end of the barrel hose or at the pump, consisting of fine mesh at the bottom of a funnel topped with a thick layer of clean gravel. See section 2:2 below for details on further purifying water for human consumption. Barrels or containers for collecting water must always be covered to prevent children and small animals from drowning in the water. A fine mesh covering in addition to a solid lid will help prevent drownings as well as keep out mosquitoes which breed in standing water. Water should be either used up or drained and stored within 10 days of collecting to prevent development of mosquito larvae. In winter months when temperatures reach freezing or below, drain and disconnect the system to avoid damaging the equipment. Store the barrels upside-down and clean thoroughly before reusing. Wherever possible, water collection systems such as rain barrels should be established at every home or group of homes. This will make water easily available for boiling and individual consumption. Rain barrels should also be set up as close to farmland as possible for irrigation during dry spells. Water will need to be transported cumbersome and long distances when collecting from a larger purification system that is not practical to have set up at each home (see 2:b:ii), as it will purify large quantities of water to be used by a greater number of people and homes. Water transportation will also be required during dry spells or the winter season when rain is not available and lake, river and creek water is the only source, which is many kilometers away from most homes. To transport water over short distances, jugs and water bags carried by wheelbarrow or bicycle trailer will work adequately. To transport over long distances, it is more efficient to carry large amounts of water to minimize the number of trips, but must still be light enough to be carried safely. For this, the best system is by bicycle, with a trailer built specifically to hold large water bins or barrels, according to what containers are available. Carrying 1 to 2 barrels per trailer would be the limit, depending on the carrier’s ability and also the distance and hills needed to travel. To build the trailer, use found materials like wood slats or plywood to build the base, 3 walls and a hinged door with latches. Follow the guide below to build an all-purpose trailer base out of wood.